Bao Bei is a proudly local establishment serving cocktails and snacks with Asian influences. Dim sum steamers adorning the wall down to the bar area are just the most obvious nods to Chinese culture. Warm woods and filament bulbs tick more modern design boxes and add a warm touch to the ambience. 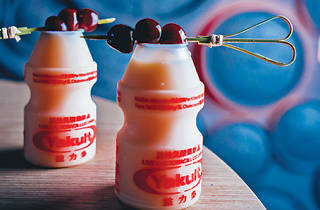 Ordering from the signature cocktail menu, we kick things off with a Childhood Memory ($118), a concoction of Vitasoy malt, Baileys and white rum, and a round of soju-based Yakult shots ($78 each). Both induce nostalgia and we assume the addition of alcohol is to elevate them for adult enjoyment. 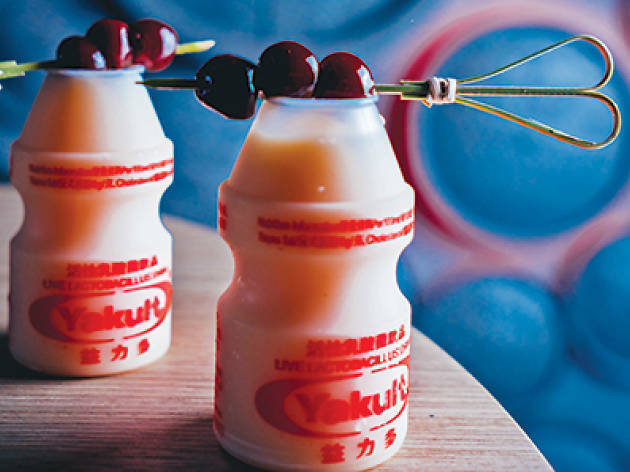 Yet, though Instagram-worthy in that they are presented in their original Vita Soy and Yakult bottles, the alcohol is almost undetectable in either. We taste no soju in the shots and the Childhood Memory is excessively malty, the promise of Baileys in the description an unprovocative tease, a recollection seemingly forgotten. For snacks, we order the tasty sounding mapo tofu fries topped with minced pork, bean curd and chilli oil ($88) and the bao bites trio ($108). The fries have no distinctive flavour and we wonder how it’s even possible to cook fries – burnt on the outside, tough on the inside – as poorly as this. The bao bites are almost inedible. The bases have a stale texture and the overwhelming pungency of the dried shrimp in the XO sauce completely overwhelms the beef and causes us to gag. The real shame is that the intimate, well-decorated space is somewhere we’d like to hang out. Sadly, the poor execution of both cocktails and snacks means our visit will remain a one off.